A documentary about Chelsea Manning, Werner Herzog’s latest and a film about Parkland students in the aftermath of the Florida high school massacre are among the selections that will premiere at the 18th Tribeca Film Festival. Organizers for the annual New York festival on Tuesday announced a lineup of 103 feature films, 40 percent of them directed by women. In the festival’s three competition sections, that figure is 50 percent — a mark that many film festivals (with some notable exceptions) have recently sought to achieve. “At Tribeca, we believe in amplifying fresh voices as well as celebrating the continued success of artists in the industry,” said Paula Weinstein, vice president of Tribeca Enterprises, which puts on the festival. Highlights include Tim Travers Hawkins’ XY Chelsea, which chronicles the former Army intelligence analyst’s life after her 35-year military prison sentence for the largest leak of classified documents in U.S. history was commuted by former President Barack Obama. Manning, who’s set to speak after the film’s Tribeca premiere, on Tuesday unsuccessfully challenged a subpoena requiring her testimony before a grand jury investigating WikiLeaks founder Julian Assange. Showtime has already acquired the documentary. Emily Taguchi and Jake Lefferman’s After Parkland is about students and parents following the 2018 shooting at Marjory Stoneman Douglas High School. 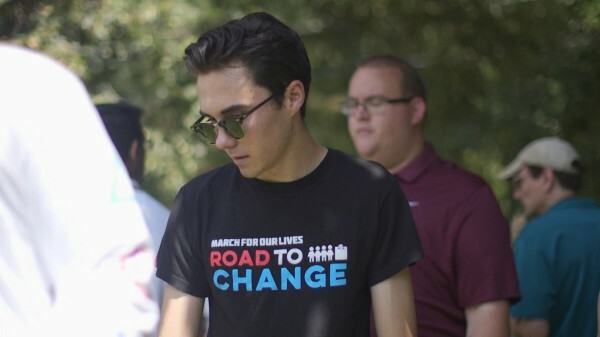 The film is one of a number of documentaries to follow the Parkland massacre, including Song of Parkland, which aired last month on HBO. Also to premiere at Tribeca is Herzog’s Nomad: In the Footsteps of Bruce Chatwin in which the filmmaker makes a journey inspired by Chatwin, the travel writer and author who died in 1989; A Woman’s Work: The NFL’s Cheerleader Problem, Yu Gu’s documentary about NFL cheerleaders; and Erin Lee Carr’s documentary After the Heart of Gold, on USA Gymnastics team doctor Larry Nassar who was convicted of serial child molestation last year. There will be a number of music documentaries, including the D’Angelo profile Devil’s Pie and The Quiet One, about Rolling Stones bassist Bill Wyman. Antoine Fuqua will premiere his Muhammad Ali documentary What’s My Name, an HBO release executive produced by LeBron James. Jared Leto and Christoph Waltz will both premiere their feature directorial debuts. Leto’s A Day in the Life of America is a documentary filmed in all 50 states on a single Fourth of July. Waltz’s Georgetown is a murder thriller in which Waltz stars alongside Annette Bening and Vanessa Redgrave. Also on tap are: the Alec Baldwin-led hybrid documentary Framing John DeLorean; the Zac Efron-starring Ted Bundy tale Extremely Wicked, Shockingly Evil and Vile; and the Billy Crystal-Ben Schwartz comedy Standing Up, Falling Down. The Tribeca Film Festival runs April 25-May 5. The festival previously announced that the HBO documentary The Apollo will open the festival at the iconic Harlem theater. Blow the Man Down, directed and written by Danielle Krudy, Bridget Savage Cole. Produced by Drew Houpt, Alex Scharfman, Tim Headington, Lia Buman. (USA) - World Premiere. While grieving for the loss of their mother, the Connolly Sisters suddenly find they have a crime to cover up, leading them deep into the underbelly of their salty Maine fishing village. With Morgan Saylor, Sophie Lowe, Margo Martindale, June Squibb, Annette O’Toole, Marceline Hugot. Clementine, directed and written by Lara Jean Gallagher. Produced by Aimee Lynn Barneburg, Davis Priestley, Karina Ripper. (USA) - World Premiere. Reeling from a one-sided breakup, heartbroken Karen breaks into her ex’s lakehouse. There, she strikes up a complicated relationship with provocative younger woman Lana in this beautifully rendered psychological drama and sexual coming of age story. With Otmara Marrero, Sydney Sweeney, Will Brittain, Sonya Walger. Initials SG (Iniciales SG), directed and written by Rania Attieh, Daniel Garcia. Produced by Ivan Eibuszyc, Shruti Ganguly, Georges Schoucair. (Argentina, Lebanon, USA) - World Premiere. An aging Argentine Serge Gainsbourg wannabe struggles with a career he can’t seem to get on track, an affair he doesn’t want, and a crime he didn’t mean to commit. With Diego Peretti, Julianne Nicholson, Daniel Fanego, Malena Sanchez, Francisco Lumerman. Swallow, directed and written by Carlo Mirabella-Davis. Produced by Mollye Asher, Mynette Louie, Carole Baraton, Frederic Fiore. (USA) - World Premiere. Hunter, a newly pregnant housewife, finds herself increasingly compelled to consume dangerous objects. As her husband and his family tighten their control over her life, she must confront the dark secret behind her new obsession. With Haley Bennett, Austin Stowell, Elizabeth Marvel, David Rasche and Denis O’Hare. Watson, directed by Lesley Chilcott. Produced by Louise Runge, Lesley Chilcott, Wolfgang Knöpfler. (USA, Costa Rica, Tonga) - World Premiere. Founder of Greenpeace and Sea Shepherd, Captain Paul Watson has spent 40 years fighting to end the destruction of the ocean’s wildlife and its habitat. Part pirate, part philosopher, Watson’s methods stop at nothing to protect what lies beneath. A Woman’s Work: The NFL’s Cheerleader Problem, directed by Yu Gu, written by Elizabeth Ai. Produced by Yu Gu, Elizabeth Ai. (USA, UK) - World Premiere. Football and feminism collide in this documentary that follows former NFL cheerleaders battling the league to end wage theft and illegal employment practices that have persisted for 50 years. Also playing as part of the Tribeca/ESPN Sports Film Festival. A Regular Woman (Nur Eine Frau), directed by Sherry Hormann, written by Florian Oeller. Produced by Sandra Maischberger. (Germany) - International Premiere. Based on real-life events, A Regular Woman gives a voice to Hatun “Aynur” Sürücü, a Turkish-Kurdish woman living in Berlin with her young son, who was the victim of an honor killing by her brother at the age of 23. With Almila Bagriacik, Rauand Taleb, Aram Arami, Meral Perin, Mehmet Ateşçi, Mürtüz Yolcu, Merve Aksoy, Armin Wahedi. American Woman, directed and written by Semi Chellas. Produced by Christina Piovesan, Pamela Koffler, Semi Chellas, Noah Segal. (USA) - World Premiere. Inspired by the headline-dominating kidnapping of heiress Patty Hearst in 1974, this atmospheric drama is a fictionalized reimagining of her time in hiding, from the perspective of Jenny, a pacifist and associate of the Symbionese Liberation Army. With Hong Chau, Sarah Gadon, Lola Kirke, John Gallagher Jr., Ellen Burstyn, David Cubitt. Charlie Says, directed by Mary Harron, written by Guinevere Turner. Produced by Cindi Rice, Jeremy M. Rosen, John Frank Rosenblum. (USA) - North American Premiere. Charlie Says, directed by masterful filmmaker Mary Harron, tells the Charles Manson story through the fresh eyes of his most devoted followers: Leslie van Houten, Patricia Krenwinkel, and Susan Atkins. With Suki Waterhouse, Hannah Murray, Matt Smith, Annabeth Gish, Merritt Wever, Chace Crawford. An IFC Films release. Dreamland, directed by Miles Joris-Peyrafitte, written by Nicolaas Zwart. Produced by Brad Feinstein, Margot Robbie, Josey McNamara, Tom Ackerley, Rian Cahill, Brian Kavanaugh-Jones. (USA) - World Premiere. Amid the dust storms and economic depression of Dustbowl Era Oklahoma, Eugene Evans finds his family farm on the brink of foreclosure. His last bet to save the farm is the bounty on the head of fugitive bank robber Allison Wells. With Margot Robbie, Finn Cole, Travis Fimmel, Kerry Condon, Garrett Hedlund, Darby Camp. Georgetown, directed by Christoph Waltz, written by David Auburn. Produced by Brad Feinstein, Andrew Levitas, David Gerson. (USA) - World Premiere. Eccentric social climber Ulrich Mott throws lavish parties with his much-older wife, Elsa, in the tony Washington D.C. neighborhood. But when Elsa is found dead, Ulrich must mount an increasingly elaborate charade to conceal his skeletons and convince everyone of his innocence. With Christoph Waltz, Annette Bening, Vanessa Redgrave, Corey Hawkins. Lost Transmissions, directed and written by Katharine O’Brien. Produced by Filip Jan Rymsza, Tory Lenosky, Al Di, Olga Kagan. (USA) - World Premiere. After famed record producer Theo Ross goes off his schizophrenia meds, introverted songwriter Hannah dedicates herself to getting him the help he needs, perhaps at the cost of her own dreams. With Simon Pegg, Juno Temple, Alexandra Daddario, Tao Okamoto, Bria Vinaite, Robert Schwartzman. Plus One, directed and written by Jeff Chan, Andrew Rhymer. Produced by Jeremy Reitz, Debbie Liebling, Ross Putman, Jeff Chan, Andrew Rhymer, Greg Beauchamp. (USA) - World Premiere. In order to survive a summer of wedding fever, longtime single friends Ben and Alice agree to be each other’s plus one at every goddamn wedding they’re invited to. With Maya Erskine, Jack Quaid, Ed Begley Jr., Rosalind Chao, Beck Bennett, Finn Wittrock. Skin, directed and written by Guy Nattiv. Produced by Oren Moverman, Jaime Ray Newman, Celine Rattray, Trudie Styler, Dillon D. Jordan. (USA) - US Premiere. Adapted from his Academy Award® -winning short film of the same name, Guy Nattiv traces the true story of Bryon Widney, a white supremacist who begins a path to redemption through a romance with a single mother intent on keeping her children out of the movement. With Jamie Bell, Danielle Macdonald, Daniel Henshall, Bill Camp, Mike Colter, Mary Stuart Masterson, Vera Farmiga. An A24 and DirecTV release. At the Heart of Gold, directed and written by Erin Lee Carr. Produced by Sarah Gibson, Dr. Steven Ungerleider, David Ulich. (USA) - World Premiere. In 2016, USA Gymnastics was rocked by the revelation that national team doctor Larry Nassar had been abusing young athletes for decades. Tribeca alum Erin Lee Carr’s unflinching documentary unpacks the scandal, its coverup, and aftermath, while giving voice to the survivors. An HBO Documentary Film. Devil’s Pie - D’Angelo, directed and written by Carine Bijlsma. Produced by Mira Mendel, René Mendel, Julia Nottingham, Thomas Benski, Lucas Ochoa, Nina Yang Bongiovi, Forest Whitaker. (Netherlands, UK, USA) - World Premiere. Acclaimed R&B artist D’Angelo was on the precipice of super-stardom when he disappeared entirely from the public eye in 2000. Now preparing a comeback tour, Bijlsma’s film finds D’Angelo at a crossroads between a haunted past and uncertain future. Dominican Dream, directed by Jonathan Hock. Produced by Phil Aromando, Alex Evans. (USA) - World Premiere. In the early 1990s, the future of basketball belonged to a young Dominican immigrant named Felipe Lopez. Featured on the cover of Sports Illustrated at the age of 17, Lopez’s story is the ultimate profile of the American dream. An ESPN release. Also playing as part of the Tribeca/ESPN Sports Film Festival. Halston, directed and written by Frédéric Tcheng. Produced by Roland Ballester, Frédéric Tcheng, Stephanie Levy, Paul Dallas. (USA) - New York Premiere. From Jackie Kennedy to Studio 54, Halston’s minimalist designs put American fashion on the map in the 1970s. Tribeca alum Frédéric Tcheng examines the work and life of the enigmatic visionary who called himself Halston. With Tavi Gevinson, Cornelia Guest, Liza Minnelli, Marisa Berenson, Joel Schumacher, Pat Cleveland. A 1091 Media’s The Orchard and CNN release. Lil’ Buck: Real Swan, directed and written by Louis Wallecan. Produced by Victor Lech, Crayton Jr. Armmer, Lil’ Buck, Nadim Cheikhouha, Machine Molle. (France, USA) - World Premiere. Dancer Lil’ Buck grew up jookin and bucking on the streets of Memphis. After a breathtaking video of him dancing to Camille Saint-Saëns’ “The Swan” accompanied by cellist Yo-Yo Ma went viral, everything changed. Sublime, directed by Bill Guttentag, written by Bill Guttentag & Nayeema Raza. Produced by Bill Guttentag, Nayeema Raza, Terry Leonard. (USA) - World Premiere. Iconic California band Sublime fused reggae, punk, ska, dub, and hip-hip into a genre-defying new sound that electrified audiences and airways in the mid-1990s. This definitive documentary charts their meteoric rise, tragic end, and lasting legacy. A Taste of Sky, directed by Michael Yuchen Lei. Produced by Andrew F. Renzi. (USA, Bolivia, Denmark) - World Premiere. A Taste of Sky delicately details the journey of two students from Gustu, the groundbreaking cooking school and fine-dining restaurant founded by Noma’s Claus Meyer in La Paz, Bolivia. With Kenzo Hirose, Claus Meyer, Maria Claudia Chura. What’s My Name | Muhammad Ali, directed by Antoine Fuqua, written by Steven Leckart. Produced by Sean Stuart. (USA) - World Premiere. One of the most iconic figures in athletic history, Muhammad Ali’s incredible story from world champion boxer to inspiring social activist is explored through his own voice and never-before-seen archival material by acclaimed filmmaker Antoine Fuqua, with executive producers LeBron James and Maverick Carter. An HBO Sports release. 37 Seconds, directed and written by Hikari. Produced by Shin Yamaguchi, Hikari. (Japan, Thailand) - North American Premiere, Feature Narrative. A breakout performance from Mei Kayama anchors Hikari’s reflective debut feature, in which a 23-year-old manga artist with cerebral palsy seeks physical, creative, and romantic autonomy. With Mei Kayama, Misuzu Kann, Shunsuke Daito, Makiko Watanabe, Yoshihiko Kumashino, Yuka Itaya. Changing the Game, directed by Michael Barnett, written by Michael Barnett, Michael Mahaffie. Produced by Clare Tucker. (USA) - World Premiere, Feature Documentary. Transgender high school athletes from across the country compete at the top of their fields, while also challenging the boundaries and perceptions of fairness and discrimination. With Mack Beggs, Sarah Rose Huckman, Andraya Yearwood. Also playing as part of the Tribeca/ESPN Sports Film Festival. Lost Bayou, directed by Brian C. Miller Richard, written by Nick Lavin, Hunter Burke. Produced by Alicia Davis Johnson, Kenneth Reynolds, Brian C. Miller Richard, Hunter Burke, Russell Blanchard, Murray Anthony Roth. (USA) - World Premiere, Feature Narrative. In this hauntingly evocative southern gothic, a struggling addict returns home to the Louisiana bayou to reconnect with her father, only to discover he’s hiding a troubling secret aboard his houseboat. With Teri Wyble, Dane Rhodes, Deneen Tyler, Hunter Burke, Terence Rosemore, Jackson Beals. Lucky Grandma, directed by Sasie Sealy, written by Angela Cheng. Produced by Krista Parris, Cara Marcous. (USA) - World Premiere, Feature Narrative. Set in New York City’s Chinatown, the film follows an ornery, chain-smoking Chinese grandma who goes all in at the casino, landing herself on the wrong side of luck… and in the middle of a gang war. With Tsai Chin, Corey Ha, Michael Tow, Woody Fu, Wai Ching Ho, Clem Cheung. An AT&T release. TFI Supported. See You Yesterday, directed by Stefon Bristol, written by Stefon Bristol & Fredrica Bailey. Produced by Spike Lee, Jason Sokoloff, Matt Myers. (USA) - World Premiere, Feature Narrative. Two Brooklyn teenage prodigies, C.J. Walker and Sebastian Thomas, build make-shift time machines to save C.J.’s brother, Calvin, from being wrongfully killed by a police officer. Driveways, directed by Andrew Ahn, written by Hannah Bos, Paul Thureen. Produced by Celine Rattray, Trudie Styler, James Schamus, Joe Pirro. (USA) - North American Premiere, Feature Narrative. In this beautifully understated drama, a lonesome boy accompanies his mother on a trip to clean out his late aunt’s house, and ends up forming an unexpected friendship with the retiree who lives next door. With Hong Chau, Brian Dennehy, Lucas Jaye, Christine Ebersole, Jerry Adler. The Weekend, directed and written by Stella Meghie. Produced by Stella Meghie, Stephanie Allain, Mel Jones, Sarah Lazow, James Gibb. (USA) - New York Premiere, Feature Narrative. A stand-up comic who’s been struggling to get over her ex finds herself instead awkwardly third-wheeling her way through a weekend getaway alongside him and his new girlfriend in this warm, wry comedy. With Sasheer Zamata, Tone Bell, DeWanda Wise, Kym Whitley and Y’lan Noel. Martha, directed and written by Selina Miles. Produced by Daniel Joyce. (Australia, USA, Germany, Brazil) - World Premiere. In 1970s New York, photographer Martha Cooper captured some of the first images of graffiti at a time when the city had declared war on this new artform. Decades later, Cooper has become an influential godmother to a global movement of street artists. You Don’t Nomi, directed and written by Jeffrey McHale. Produced by Jeffrey McHale, Ariana Garfinkel, Suzanne Zionts. (USA) - World Premiere, Feature Documentary. Released in 1995, Paul Verhoeven’s Showgirls was met by critics and audiences with near universal derision. You Don’t Nomi traces the film’s redemptive journey from notorious flop to cult classic, and maybe even masterpiece. With Peaches Christ, Jeffery Conway, April Kidwell, Haley Mlotek, Adam Nayman, David Schmader. Gay Chorus Deep South, directed by David Charles Rodrigues, written by David Charles Rodrigues, Jeff Gilbert. Produced by Bud Johnston, Jesse Moss. (USA) - World Premiere, Feature Documentary. To confront a resurgence of anti-LGBTQ laws, the San Francisco Gay Men’s Chorus embarks on an unprecedented bus tour through the Deep South, celebrating music, challenging intolerance, and confronting their own dark coming out stories. With The San Francisco Gay Men’s Chorus, Oakland Interfaith Gospel Choir, Dr. Tim Seelig, Ashlé, Jimmy White. I AM HUMAN, directed, written, and produced by Taryn Southern, Elena Gaby. (USA) - World Premiere, Feature Documentary. Advancements in neurotechnology are revolutionizing what it means to be human. Following three subjects who undergo brain interface treatment, I AM HUMAN examines the ethical quandaries in brain exploration and simulated cognitive evolution. Inna De Yard, directed and written by Peter Webber. Produced by Gaël Nouaille, Laurent Flahault, Laurent Baudens. (France, Belgium) - World Premiere, Feature Documentary. A joyous portrait of a group of pioneering reggae musicians, Inna De Yard captures the ongoing relevance of reggae and its social values, and the music’s passion to revitalize an older generation while passing it on to younger listeners. With Ken Boothe, Kiddus, Winston McAnuff, Cedric Myton, Judy Mowatt.